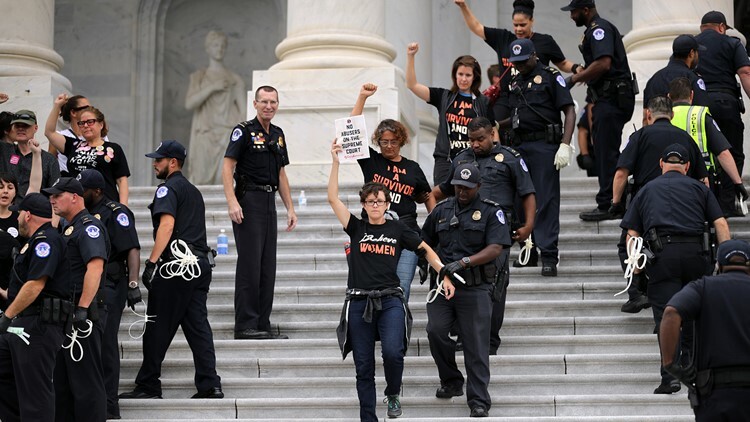 Capitol Police said officers arrested 164 people Saturday as hundreds of protesters — many dressed in black garb — climbed over barricades and up the east steps ahead of Saturday's vote on the Brett Kavanaugh Supreme Court nomination. Protestors held signs reading "Kava Nope" and "Shame, Collins," the latter a reference to the announcement by Sen. Susan Collins, R-Maine, that she planned to vote in support of the embattled judge. As demonstrators clapped in unison and chanted "November is coming" and "Vote them Out!" Capitol Police, who said about 150 of the arrests occurred on the east side, led protesters away one by one. Some protestors raised their fists as they were escorted down the steps. At the base, the arrested demonstrators, with hands restrained behind their back with plastic cuffs, waited peacefully in line before police took them away. Inside, the beginning of the roll call vote two hours later, screams and shouts of "Shame on You!" and "I do not consent" rang out frequently in the Senate gallery, with Vice President Mike Pence, presiding over the session, repeatedly calling on the sergeant at arms to "restore order in the gallery." Demonstrators block the main entrance door as they take the steps of the US Supreme Court protesting the appointment of Supreme Court nominee Brett Kavanaugh in Washington DC, on October 6, 2018. 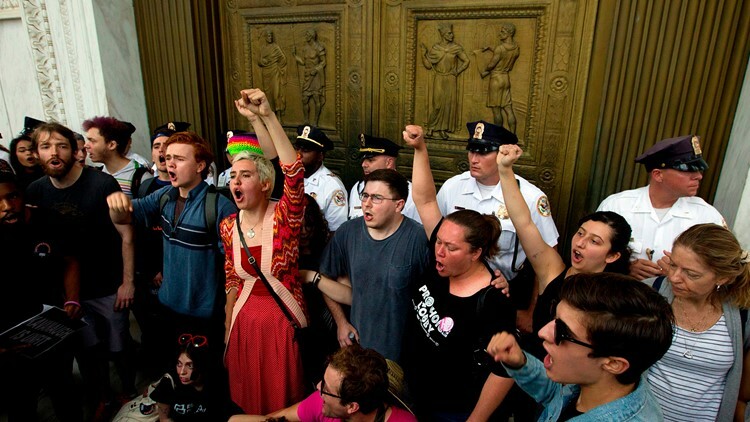 Shortly after the Senate voted to confirm Kavanaugh, protesters occupied the steps of the Supreme Court. The demonstrators went up the steps of the Supreme Court holding signs and chanting, "we believe survivors" and "hey hey, ho ho, Kavanaugh has got to go." Officers blocked the doors to the court and were face-to-face with the protesters. Some of the demonstrators climbed the building's columns, and women sat on the two marble statues beside the steps. 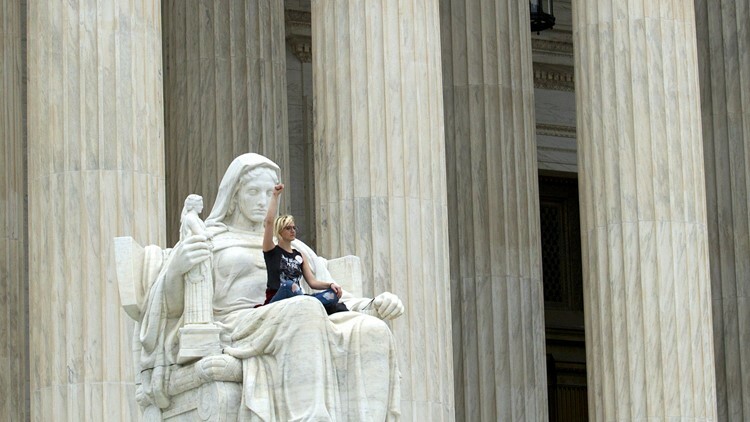 Demonstrator Jessica Campbell-Swanson of Denver, Colorado, sits on the lap of the 'Contemplation of Justice' statue as protestors take the steps of the US Supreme Court against the appointment of Supreme Court nominee Kavanaugh, October 6, 2018. Barbara Telfair, 73, of Brooklyn, was among the two busloads of protesters who came down from New York. She said the call to join the group came on Friday. “I couldn’t stay home. It’s an absolute disgrace,’’ she said. Many were angered by what they believed was the dismissal of allegations by Dr. Christine Blasey Ford, in testimony before the Senate Judiciary Committee, that Kavanaugh had sexually abused her when she was 15 and he was 17. Standing outside the Supreme Court building steps and talking to a boisterous crowd, Sen. Elizabeth Warren, D-Mass., suggested a way people against the Kavanaugh confirmation could respond. Initially, she said, people will have to live with the "hurt" of losing the confirmation battle then use those emotions to rally against the GOP and "take back control" of the government. The midterm elections that now sit weeks away provide Democrats with a chance to win back several crucial political seats,she said..
"We have forged a bond that will make us stronger in the next fight," Warren said. U.S. Capitol Police arrest more than one hundred protesters after they occupied the center steps of the East Front of the U.S. Capitol October 06, 2018 in Washington, DC. Across the plaza from the Capitol steps, Chuck Thompson of LaGrange, Georgia, held a handmade "Confirm Kavanaugh" sign and was debating the nomination with Kit Sczudlo of Seattle, Washington. When Sczudlo argued the FBI should have interviewed Ford, Thompson asked what the investigators were supposed to learn when she had already said she could not remember details about where the alleged attack happened. Sczudlo also complained about Kavanaugh condemning Democrats, saying that Justice Clarence Thomas, who was confirmed to the court in 1991 amid allegations of sexual misconduct, did not blame a political party for going after him. Thompson said he believed Thomas, who was nominated by President George H. W. Bush had done that, and reached for his phone to look up the quotes. The conversation didn’t get much further until another anti-Kavanaugh protester came up and told Sczudlo not to talk to pro-Kavanaugh people because she believed they were police trying to provoke the demonstrators into violence so they could be arrested. Both Sczudlo and Thompson looked at her confused, but Sczudlo walked away.